Having lived in Dubai for almost 6.5 years now… I’ve developed a taste for middle eastern food. I love grabbing my mezze platter with vine leaves, hummus, falafel (whenever I hear that they’re baked?, my eyes pop) and more. I love chickpeas! I made this yummy meal two weeks back for lunch. 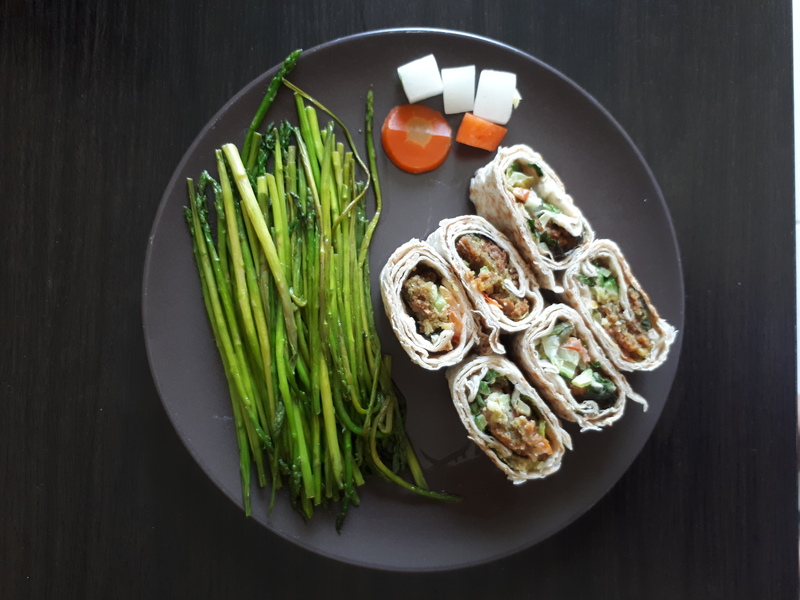 I’ve used whole wheat wraps (homemade, just water and wheat), home-baked falafel, my favorite asparagus as my side, and some apple cider vinegar pickled veggies that you see. This was to die for! What you don’t see here is an indulgent tahini and yogurt dip that I also made with it. Match made in health heaven I say… But hey! This may not be ideal for everyone. I’m not scaring you but informing you. For instance, I don’t do too well with wheat but sometimes I eat it. Then I balance or measure my nutrients for another meal. Ask me if you need help. ?Mix the ingredients in a mixer/blender/processor. ?Make a soft dough like batter out of it. Then use the dough to make soft small balls; flatten a bit. ?Use a butter paper on a tray and spread out the flattened falafel cakes. ?Put it in the oven. I usually take 40 mins for them to cook. It depends on the oven. Look for it to turn lightly brown. Then ENJOY… Please watch portions, my healthy eaters :)?? If you have tried this version, let me know, or if you have questions around what kind of food, you can have? Let me know. ← Wholesome and Oh! So yumm… fruity sprout salad.